The integration of building system networks can take place at different levels of a network: physical, network, and application levels. By recognizing the commonality of the systems or networks, there are opportunities to consolidate and share system resources, resulting in greater efficiencies; this is what forms the basis for the financial metrics of integrated systems. 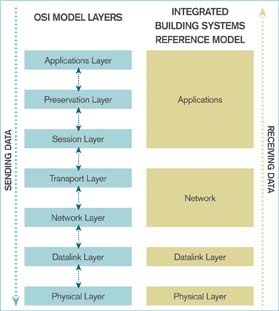 The International Standards Organization's (ISO) development of the Open System Interconnection (OSI) model presents seven layers of network or system architecture, with each layer defined for a different portion of the communications link across the network. The modified model for integrated systems indicates the network layers where there are opportunities for integration and consolidation. Historically there have been many methods used to obtain systems integration. The most basic and oldest form of systems integration is "hard-wired integration." A typical example is two standalone building systems physically connected via an electrical "dry contact," RS-232 or RS-422 connection. These systems do not share any data but are simply connected to signal "off" and "on" conditions. This is your father's integration. There is also proprietary integration, where all the systems and components are provided by one manufacturer. All the components have been designed to work with each other. There are several downsides to this approach. The facility manager is locked in to one manufacturer for a complete system life-cycle. There's no or little competition in procuring additional equipment and services. And the facility manager could be missing out on advances by other manufacturers. Today, these "packaged" systems are primarily targeted to smaller buildings and the residential marketplace. A step up from proprietary integration is the use of Application Programming Interfaces (APIs). In this approach, two manufacturers of different building systems agree to open their products to each other, and they jointly develop an API. This may work if only two systems are involved; however, it can be difficult to manage all the APIs needed to get multiple proprietary building systems to talk to each other. The best current approach to systems integration is based on standard communications protocols for the network layer of the building systems, IT programming languages such as Java and XML, and IT hardware such as servers and network equipment.